This war is like riding a powerful beast without a saddle. I hang on for dear life only because I don’t dare let go. The latest briefing says that casualties are expected to exceed 99.99%. You wish you could say you were surprised, but at this point nothing surprises you. You were the one that stood up and lied to the public that the war was going well. You lied that peace with the androids was impossible. You lied that there was no threat of robot infiltrators - the so called “killer synths”. You lied that they weren't working on a super-weapon. You lied to generate political will for the war. 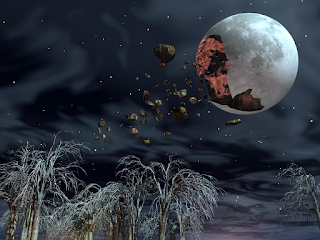 When the first news reports started coming in about the chunk of the moon falling to Earth, it was almost...a relief. And in the last few days, you’ve lied about how much damage it’s going to do. Most people understand that it’s going to throw dust up in the air and cause an extinction level event (“like the dinosaurs”) but everyone thinks they’re going to be the one to figure out how to survive in some Mad Max wasteland. The truth is, the atmosphere is going to ignite and kill billions instantly. Plants will burst into flames, the air will become impossibly thin for anyone not caught in the initial fireball (or without breathing gear). Most of humanity will die within minutes–gasping for air that just isn't enough, if not consumed by flame. Those who somehow survive will struggle with zero food supplies. Pretty much anyone not already in a military grade bunker (with years of backup food and artificial light arboretums running on fusion power) has somewhere between a few minutes and a couple of days to live. It will be a horrible painful death for anyone not caught in the fireball. The thing is, your life was never supposed to go like this. You were always about truth. You cared about humanity. You didn’t want a robot genocide on your hands. You thought you could help avoid just such a disaster. Fine, no one likes robots, but why not just leave them alone on the moon where they weren’t hurting anyone? And with the US taking a direct governing role in all of Earth politics, you thought that a position as press secretary would be a way to do some good in the world. Yet the longer you are here, the more you realize that the administration simply wants the rationalization for genocide so that they can seize the Helium 3 processors that the robots built, and they are willing to lie about everything to get it. You gave up on changing the system from within long ago, and you’ve been looking for a way to leak information to the press corp, but your assistant Reece watches you SO closely that you held back anything but a few details here and there with reporters you knew you could trust. Now it seems like such half measures have been completely useless. Knowing what is coming (a painful death) with the chunk of moon landing on Earth, you used a contact in the intelligence community to acquire cyanide capsules, and you gave them to your family. Your partner and two children are now dead on the couch at home like one of those horrible old photos, their heads lolled to the side. You debated taking your own capsule, but you decided to make one last press release so the rest of the world would have the same option you did. You headed into the White House, recorded the message, set it to play in just a few minutes, and then left to return home. You’re barely holding yourself together. And you’ve been summoned to a top level meeting. What now? In the know: A press secretary has access to a LOT of information, and can sometimes even put things together that they’re not supposed to know by connecting the dots. Once per scene you may petition a storyteller to know a lot about a specific event or topic. This will not convey a skill set to your or knowledge that you wouldn’t otherwise understand. (You might have intel on Helium 3 production, but you wouldn’t know how to build a reactor.) The ST will give you a good deal of information. While this can be used on another character or a plot point, it will only reveal what “good reporting” may already know. It cannot reveal character secrets, things that have just happened, or anyone’s feelings. Stage Presence: Because few of us have the snappy ability to answer with as much social grace as a press secretary. In any performance type moment, you may use this ability to let everyone you’re addressing know that you are witty, debonaire, and did not say “um” as much as you actually just did. I Call my Contacts: “Once per scene you can arrange for something that a powerful web of contacts would be able to provide. This can be anything from researching information to the delivery of a basic object to doing you a small favor. Most use of contacts will take a few minutes--longer if the task is harder. They Owe Me One: Once per scene, you may call a high ranking journalism contact and put out a story. It will take a few minutes for the story to break, no matter how juicy it is, but will take longer if it’s not of extreme interest. The story will get out to millions within a few minutes. Avery is someone you have worked with well. Though an android, Avery has become a strange sort of robot friend. Avery helps you see the other side of things when you begin to wonder why you even try. Valentine DeWhit is a human, non-public liaison between humans and androids. You have become friends as you worked closely the past few years. Valentine seems flustered of late, but when you ask what’s going on, they can’t explain themselves. Maybe it’s a secret part of their job. You are so tired of secrets. Imari Kothari is known to dislike androids, and yet here they are preaching peace with them. It pisses you off that they are being so two faced. Ambassador Uriel Petrovich is not someone you know closely, but they are a powerful ally as the UNR ambassador. As of late they seem to have done a complete reversal in their support for the war. Their inability to influence their people reminds you of your own frustrations. You’ve been working with Uriel quite a bit to try and avoid war--futilely. You still can’t believe you got this gig. Press secretary. Never mind that you are a senior White House Staff member, but to be the Press Secretary is a dream you’ve had since you knew it was a thing. You would pretend to be answering questions from the press corps as young as seven. There’s so much good you can do from this position. You’re going to write position papers that are eloquent and convince the administration to alter policy. You’re going to help people. In particular, you’re going to help the world see that extended war and genocide are wrong. It’s enough that the robots are now all on the moon. There’s no sense trying to destroy them. You had sort of hoped that the peace conference would be more successful. You’ve gotten the feeling that most of the higher ups aren’t even interested in peace and that you’re just going through the motions to have something to tell the press about. (Look how hard we tried, but those androids are SO unreasonable.) They keep asking you to stress how hard the various human players have tried to bridge these irreconcilable differences, but if anything you’ve seen the opposite during your time at the conference. It seems like it’s the robots trying and the humans who have predetermined that this negotiation will fail. You hope you’re wrong about that, but you’ve been getting that feeling everywhere. You’re in a last broad salon/consortium on the final day of the conference. The wind is blowing, but you’ve been told to pay attention to how every last reasonable effort is being made so that you can brief the corp accordingly. Guest Blog for Writing About Writing?